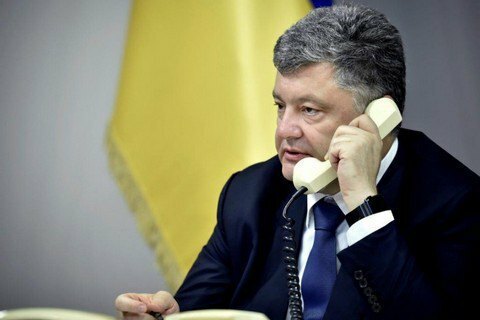 Poroshenko requested a phone conversation with Putin. Due to the provocative actions of Russia in occupied Crimea and escalation of its actions in Donbas, President Petro Poroshenko has held a meeting with security officials and leadership of the Foreign Ministry, his website has said. The supreme commander-in-chief instructed the command to enhance combat readiness of the Armed Forces, National Guard, Border Service and Security Service of Ukraine (SBU). "Special requirements are set for the border guards in the areas of administrative border with temporarily occupied Crimea and on the touch line in Donbas," he said. Poroshenko instructed the National Guard and National Police to enhance the protection of strategic facilities and infrastructure to prevent possible terrorist attacks. The SBU chief must conduct an emergency meeting of the Antiterrorist Centre and hold all the necessary tasks. The defence minister, the chief of the General Staff, the SBU chief and the foreign minister of Ukraine were instructed to carry out meetings with leadership of diplomatic missions accredited in Ukraine and inform on the developments in the area of administrative border with Crimea and on the touch line. The Foreign Ministry must organise phone conversations with leadership of Germany and France in trilateral Normandy format, request for conversation with US Vice President Joe Biden and President of the European Council Donald Tusk, as well as initiate a conversation with President of Russia Putin. Foreign Minister Pavlo Klimkin must instruct the head of Ukraine's mission to the UN to hold consultations in the UN Security Council and inform on the developments in details. "It is necessary to address the OSCE SMM with request for a maximum increase in the number of OSCE observers in the area of the administrative border with Crimea and require the Russian side to provide access to the institutions in Crimea for the OSCE SMM representatives," the president said. The president also said representatives of international human rights organisations and the Ukrainian ombudsman must be given access to Ukrainian citizens captured in Crimea to check the conditions of their detention and protect their interests. "The Foreign Ministry and the Border Service should address Ukrainians with request to refrain from visiting Crimea due to numerous provocations committed against Ukrainian citizens. It is also my personal request," Poroshenko said. Foreign Minister Pavlo Klimkin noted that the embassies and diplomatic institutions had clearly outlined Ukraine's position. The minister has already conducted a series of phone conversations. "We will pay special attention to international organisations. We have started consultations in the UN Security Council pursuant to your instruction, but we will also focus on the OSCE, the Council of Europe and the European Union," he said. The chief of the Ukrainian Defence Ministry's Main Intelligence Directorate, Valeriy Kondratyuk, said that an armed clash had taken place between soldiers of the Russian Armed Forces and border guards of the Federal Security Service (FSB) of Russia. In his turn, Border Service chief Viktor Nazarenko said that four Russian UAVs launched from Armyansk had been detected above mainland Ukraine. SBU chief Vasyl Hrytsak noted that his service had already enhanced combat readiness. "We are now holding sessions of the Antiterrorist Centre paying special attention to the protection of critical infrastructure and watching the activities of a number of persons suspected of involvement in subversive groups to prevent possible terrorist attacks," he said. Chief of the General Staff Viktor Muzhenko said that military units of the Armed Forces in the area of the administrative border with occupied Crimea had enhanced combat readiness. He dismissed reports on the alleged shelling of temporarily occupied Crimea by Ukraine as absurd. "This is complete nonsense. We did not open fire. It can be confirmed by any military or civilian living there because shelling sounds can be heard at a considerable distance," Muzhenko noted.